We are changing our data updates to update older values instead of just appending values each month (as of 2019/02/19). The old file will be kept as refernce. Monthly values for 1854/01 - present. 2.0 degree latitude x 2.0 degree longitude global grid (89x180). 88.0N - 88.0S, 0.0E - 358.0E. The monthly analysis extends from January 1854 to the present, but because of sparse data in the early years, there is damping of the analyzed signal before 1880. After 1880, the strength of the signal is more consistent over time. ERSST is suitable for long-term global and basin-wide studies, and smoothed local and short-term variations are used in the dataset. For more information see https://www.ncdc.noaa.gov/data-access/marineocean-data/extended-reconstructed-sea-surface-temperature-ersst-v5. PSD standard NetCDF4 ~60 Mbyte file for the monthly file. PSD standard NetCDF4 1 Mbyte file for each long term mean file. Land points are flagged with a value of -9.96921e+36. To cite use of dataset: Boyin Huang, Peter W. Thorne, Viva F. Banzon, Tim Boyer, Gennady Chepurin, Jay H. Lawrimore, Matthew J. Menne, Thomas M. Smith, Russell S. Vose, and Huai-Min Zhang (2017): NOAA Extended Reconstructed Sea Surface Temperature (ERSST), Version 5. [indicate subset used]. NOAA National Centers for Environmental Information. doi:10.7289/V5T72FNM [access date]. 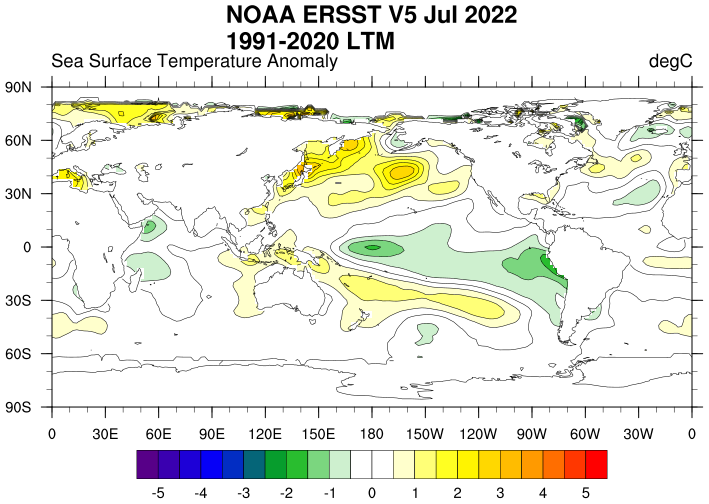 Please note: If you acquire NOAA_ERSST_V5 data products from PSD, we ask that you acknowledge us in your use of the data. This may be done by including text such as NOAA_ERSST_V5 data provided by the NOAA/OAR/ESRL PSD, Boulder, Colorado, USA, from their Web site at https://www.esrl.noaa.gov/psd/ in any documents or publications using these data. We would also appreciate receiving a copy of the relevant publications. This will help PSD to justify keeping the NOAA_ERSST_V5 data set freely available online in the future. Thank you! Huang, B., V.F. Banzon, E. Freeman, J. Lawrimore, W. Liu, T.C. Peterson, T.M. Smith, P.W. Thorne, S.D. Woodruff, and H.-M. Zhang, 2014: Extended Reconstructed Sea Surface Temperature version 4 (ERSST.v4): Part I. Upgrades and intercomparisons. Journal of Climate, 28, 911–930, doi:10.1175/JCLI-D-14-00006.1 (link is external). Liu, W., B. Huang, P.W. Thorne, et. al, 2014: Extended Reconstructed Sea Surface Temperature version 4 (ERSST.v4): Part II. Parametric and structural uncertainty estimations. Journal of Climate, 28, 931–951, doi:10.1175/JCLI-D-14-00007.1 (link is external). Huang, B., P. Thorne, T. Smith, et. al, 2015: Further Exploring and Quantifying Uncertainties for Extended Reconstructed Sea Surface Temperature (ERSST) Version 4 (v4). Journal of Climate, 29, 3119–3142, doi:10.1175/JCLI-D-15-0430.1 (link is external).